As ever, Nick and Mo have been the most amazing hosts, housing and feeding all course participants, and providing constant tea (or cold drinks, we had glorious sunny weather) and great good humour! The course participants this time had all been together here last April so we all now know each other and it was great to catch up on what everyone had been doing in the interim. On that previous workshop, the key word that emerged was sloooowly. This time our keyword was ‘release’. To allow (something) to move, act or flow freely. I really like the image of letting our horses free to flow. So when did we need to release? 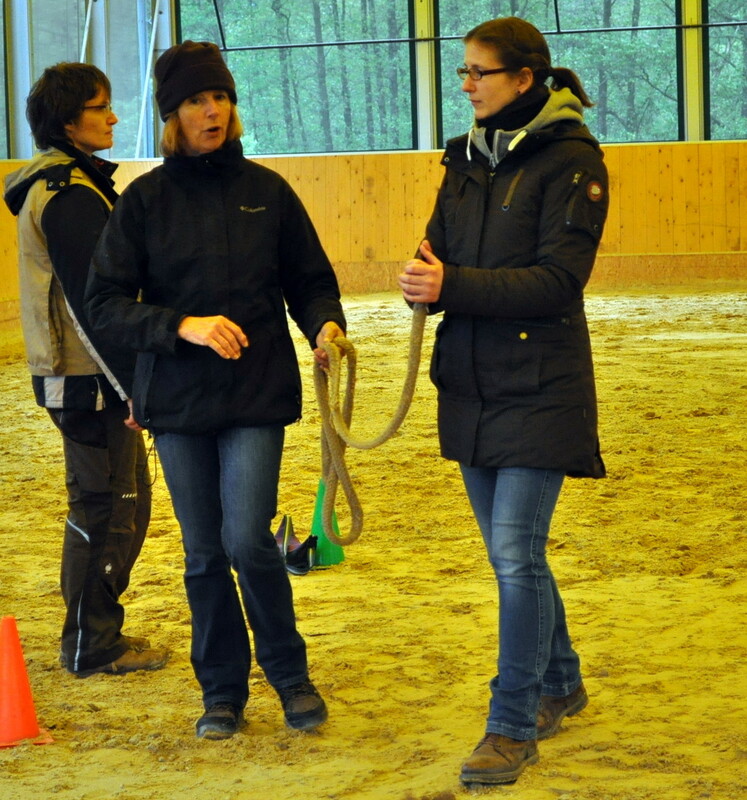 Every time we activate a lead rope or reins to ask for a behaviour and feel the slightest try or first movement (the lean to go forward, or even the chest muscle twitch for back) that’s our moment to release. The release says ‘yes! You got that right now just keep going until you hear a click or I ask for another behaviour. In that way the release is also encouragement to continue. 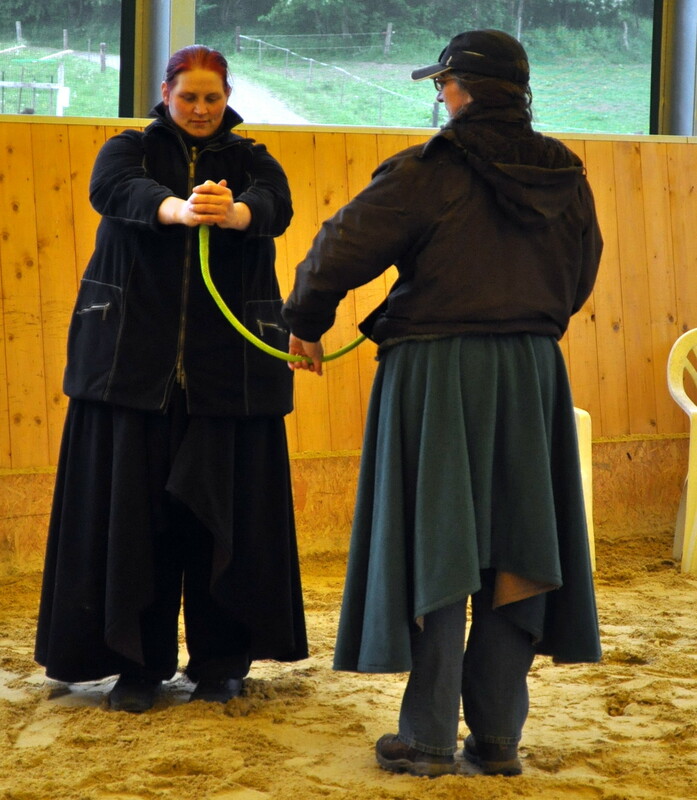 Release does not mean simply drop the lead rope or reins, rather it means give it back tactfully. 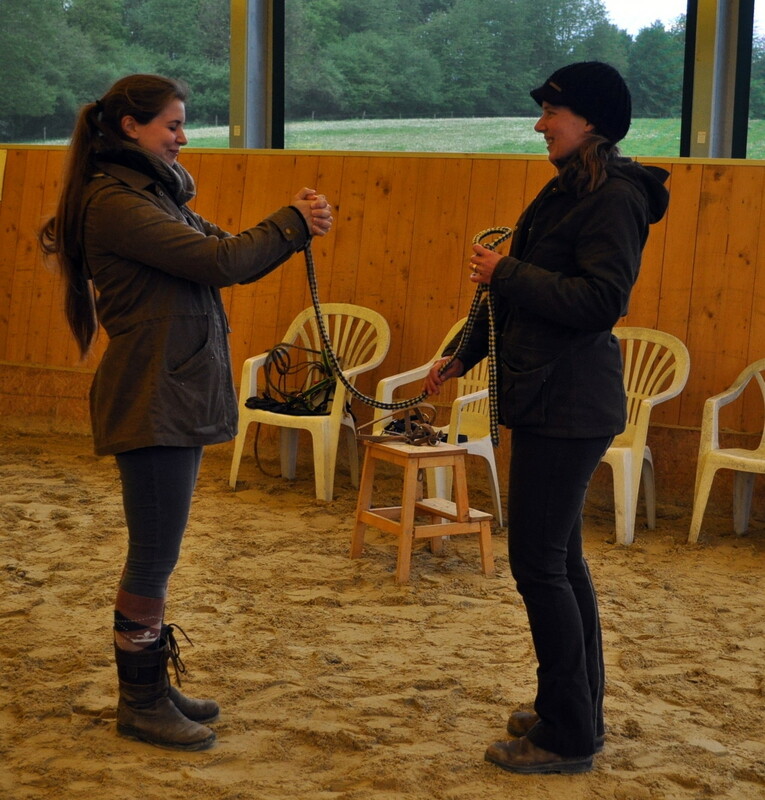 Our human horse work gave participants the opportunity to feel the difference between simply dropping the reins (rude and abrupt) and giving back the reins smoothly (gentle and reassuring). The release should be complete. In some situations walking alongside their horses, handlers were happy to release their front hand but were still holding up the other hand. We likened this to driving with the handbrake on! When we let go completely we can move off smoothly. However it can be hard and so initially we had handbrakes left slightly or half or even fully on. What’s important to remember is that, having released fully, you can always pick up that rein or rope again when and as necessary. Release does mean you are trusting your horse, whether it’s just for that fraction of a second before a click or for the time it takes to walk half a circle together….. We all, including our horses, appreciate being trusted. The morning after a workshop in Oakfield Farm Dorset, I was sitting in the conservatory looking out over several fields of gorgeous Icelandic horses grazing and snoozing contentedly in the early morning sun. It’s a great way to relax after three full days of clicker training with a great bunch of people and horses! One was Venja, an Icelandic mare imported directly from Iceland several months ago. Her new owner has been very busy and couldn’t give her the time she needed so she has been staying with Nick Foot at Oakfield Icelandics Farm. In Iceland horses live out, essentially in the wild, until they are old enough to be started under saddle. They are then herded en masse into a pen and the chosen horse is picked out. A head collar is put on and the horse is taken out to be bridled, saddled and ridden for 20 min before being returned to the pen. At the end of the day the horses are turned out and the process is repeated again the next day. In Venja’s case, this left a horse who was quite fearful of humans and could not be caught in a field. Prior to the clinic, Nick and Alison had done quite a bit of work with Venja, including sitting in her field with a book and feeding her treats from a bucket, when she approached. She would not come close enough to touch or be caught and had to be herded down to the yard (gently) and into a pen as she also had an issue with her pelvis and needed some chiropractic work. Nick wanted to be able to catch her in the field and lead her down to the yard, so this was our objective! Her initial sessions were in a pen. We started with just the polite manners game (Grown Ups Are Talking) where the horse stands politely alongside you with their head in front of their body and is clicked and treated for keeping it there. In Venja’s case we were particularly looking for relaxation. In the confines of the pen, she was able to take treats from Nicks hand. Slowly we introduced scratching around the withers and neck. In her next session we took her head collar off. 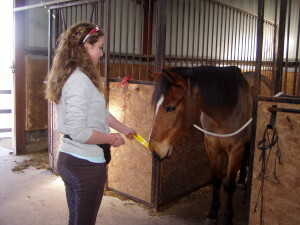 We wanted to make sure that she could still take treats from a hand when she wasn’t “trapped” by the head collar. Same format with polite manners, scrithes, and targeting Nicks hand. A big improvement was that she moved to touch his hand. We had another short session (all sessions were kept quite short!) later that day where Nick started to move around her, all the time clicking and treating for softness and relaxation. We then moved to the field. She followed her companion to the gate and allowed Nick to stand close, so CT. After an initial hesitation, she took her treat and stayed for more. She then relaxed and was happy to target, be scratched and allow Nick to move around her. When Nick moved a couple of steps away and invited her to follow, she did so willingly. In her next session I introduced myself to Venya and we had some scratches and rubs. 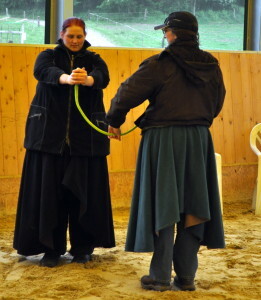 Nick produced the head collar and had her target it several times before slowly putting it on her in easy stages. He then added the lead rope and they went for a very short walk. You can watch our evening session at the end of day 2. A huge improvement …… objective achieved and we still had a day to consolidate, take her for short walks and move on to grooming and meeting a saddle again in the yard. It was great to see the transformation of this little mare from high headed and tense near humans to trusting and relaxed. Clayton poses with some of the group. At just 3 and 1/2 years old, he’s already a very big boy!